Before the Colonial era, Apaches relied for food on a “triptych of hunting, gathering, and raiding,” explained Thomas Mails in The People Called Apache. Mails was writing specifically about the Mescalero Apaches of New Mexico, Texas, and Mexico, but the same can be said of White Mountain Apaches. Acorns, seeds, and nuts were staple foods in their largely plant-based diet, which also included rabbits, birds, raccoons, fish, and other native animals. Food was local. “If you lived in the Pacific Northwest, you would know the six types of salmon and know how to harvest them, but if you were a Navajo Indian on the Midwestern plains, you never would have seen one,” Frank says. Early European contact and trade introduced new foods, which many Native American chefs today also consider part of their peoples’ authentic culinary tradition. 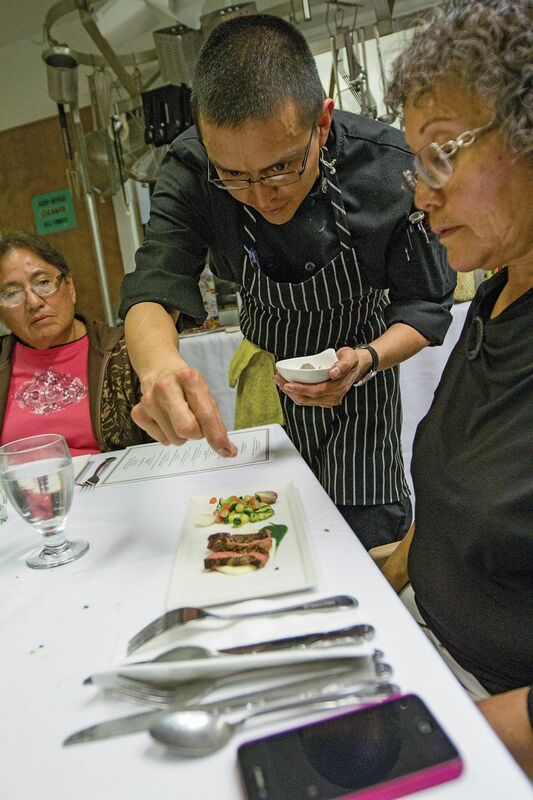 “It’s fair to talk about Navajo sheep even though sheep were imported to the Americas, just as we now consider the tomato to be an authentic and indispensable part of Italian cuisine even though it came from Mexico,” Frank says. Then there is the food that arose from what Frank calls the third phase of Native American culinary history—the reservation experience. Deprived of most of their lands, Native Americans became dependent on federal rations, which often took the form of lard, flour, and processed sugar. With these, they made fry bread, which has become the food most associated with American Indian cuisine. Depending on how much sugar is added, it can taste like a slightly richer version of Indian (not Native American) paratha or something almost as decadent as state-fair elephant ears. But what does all this history add up to today? In other words, just what is Native American cooking? When I pose the question to Loretta Barrett Oden—who opened the Corn Dance Café in Santa Fe, New Mexico, in 1993 and is considered a pioneer of new Native American cuisine—she repeats it back to me: “That’s the question, isn’t it? Just what the hell is Native American food? The Corn Dance Café closed in 2003, but Oden continued to evangelize, including in an Emmy Award–winning television series, Seasoned With Spirit, which aired on PBS in 2006. Currently she’s consulting with the Wilton Rancheria Indians about opening a Native American restaurant as part of their proposed casino project in Sacramento County, California. CRAIG TURNS off the main road connecting the community of Cibecue (famous for an 1881 Apache revolt) to Whiteriver and parks beside a two-acre garden known as “the People’s Farm.” The garden has been operating for several years with federal grants, tribal funds, and contributions from the Johns Hopkins Center for American Indian Health, which has a small office next to the Whiteriver Indian Health Service Hospital, where Craig was born. The farm employs four full-time tribal staff members, selling its crops on site and at a nearby weekly farmers’ market. Craig is preparing for a tasting dinner he’s hosting tomorrow night for six people. 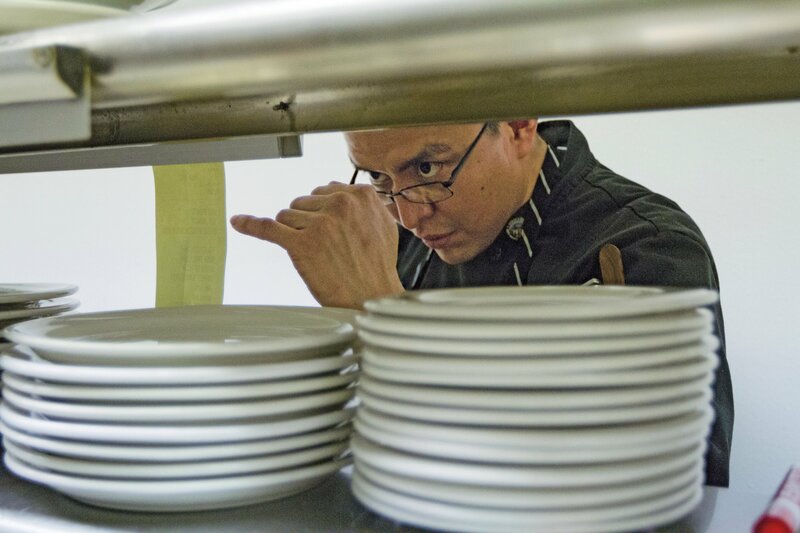 Such dinners are uncommon in the summer off-season, when Craig operates with a skeleton crew, but he hosts these indigenous-cuisine showcases up to four nights a week during the busy ski season. He wanders through the rows, picking out squash blossoms. Weeks earlier, he had taken rocks from the nearby riverbed to use as plates—“I’ll return them at the end of the season,” he says. On the following morning, Wednesday, the day of the tasting meal, I join Craig, his son, and two Apache assistants, Juwon Hendricks and Randal Cosen, and forage for edible plants among the aspen and pine trees surrounding the resort. We pick meadow rue, which has a delicate peppery taste; oxalis weed, which tastes like green apple; penny-bun mushrooms; and various wildflowers for plating. About 80 percent of the patrons who attend Craig’s tasting dinners are Native American, he says. Wednesday night’s group of six will include both Natives and non-Natives. It’s a company gathering—board members of a local Christian in-home caregiving service are celebrating a recent milestone. The cost of the tasting is $89 per person. Prior to the group’s arrival, Craig and his assistants clear a portion of the kitchen for a round dining table. On a nearby counter, he places various books celebrating Native American cuisine and history. There are also cookbooks from his travels to Germany, Brazil, and Japan, all places where he’s hosted dinners to showcase Native American cuisine. 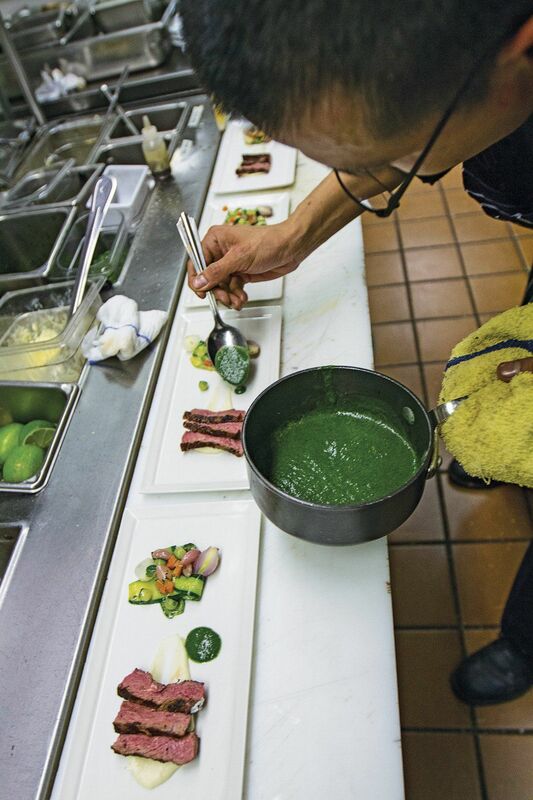 (Craig has also prepared a Native-themed menu at the James Beard House in New York City.) A banner over the dish-washing station reads: “Apaches Do It Better.” I stand alongside Craig and his three assistants as they prepare and serve the meal, and they give me small servings of each course. Craig prepares each of the heavier courses two ways. Seared salmon—“it’s not local, but a nod to our indigenous brothers and sisters in the Pacific Northwest,” Craig tells the guests—is served on the riverbed slates alongside rock moss and charred pine needles. It accompanies balls of thinly sliced salmon stuffed with wild mushrooms cooked sous vide. There is also seared duck breasts (coated with lemon- and honey-infused tea) served alongside duck confit, as well as paprika-coated rabbit loins and a rabbit rack of ribs with Craig’s Nana sauce, a parsley concoction named for a famous Apache warrior who fought federal troops well into old age. And there is bison tenderloin, served alongside chunks of rich, roasted bone marrow, as well as venison served in one version atop a parsnip purée and in another with wild rice. Next month Craig will have his biggest showcase yet: he’s one of several Native American chefs (including Frank) who have been invited by the Chef’s Garden—a Huron, Ohio, farming company that grows produce used by many of the country’s top restaurants—to cook for more than 100 visiting chefs at a conference. 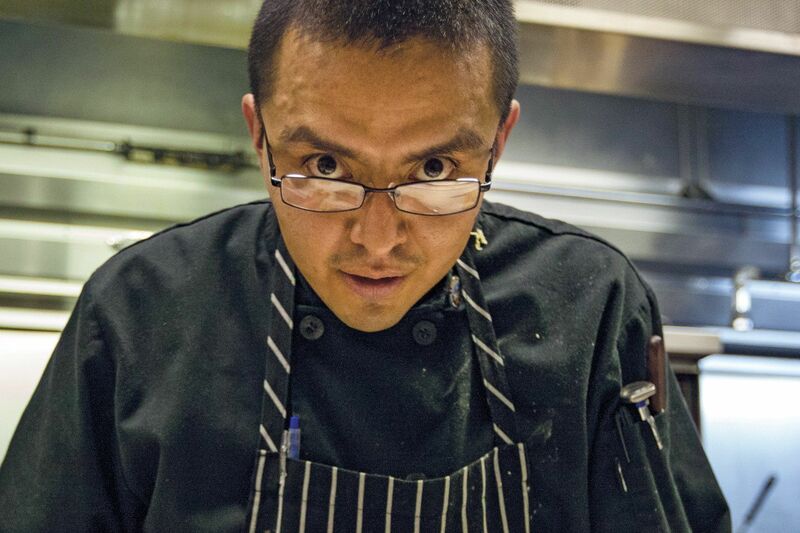 “I’m hoping not just to present my version of Native American cuisine but to demonstrate to all these other chefs, who specialize in many different traditions, the indigenous roots of all types of cooking in the Americas, no matter what the cuisine,” he says. To be sure, Craig’s high-end cooking isn’t going to address the health crisis among average Native Americans. According to the 2010 census, more than half of the 13,409 people on the Fort Apache reservation live below the poverty line. And the impoverishment extends to the land, once rich with fields of alfalfa and other crops but now largely fallow. In Cibecue, there’s a lone convenience store whose mostly barren shelves stock Pringles and a few other packaged snacks but no fresh fruit or vegetables. “This area, which used to be rich with food, is now a food desert,” Craig says. He is trying to tackle this problem, too. Earlier this year, he co-founded a nonprofit dedicated to revitalizing agriculture and water use among Western Apaches. The organization has since built a garden in McNary, a small community on the reservation. 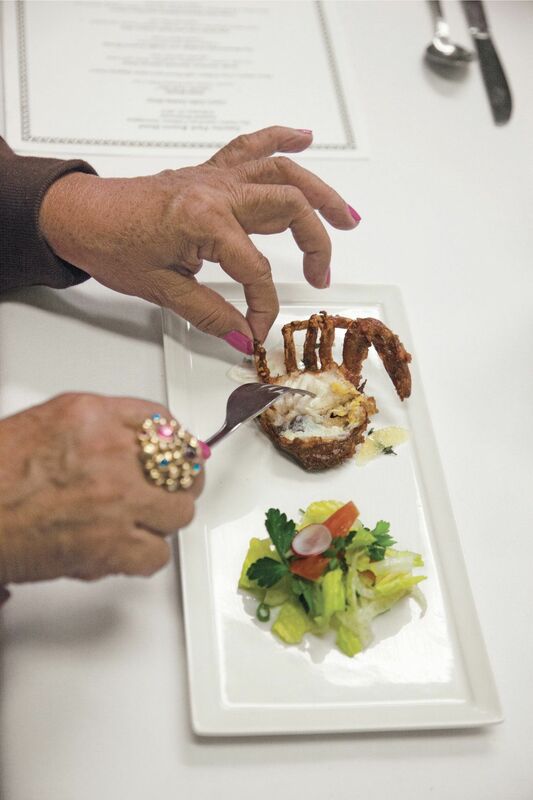 It has also hosted cooking workshops at the Sunrise Park Resort and begun a program to deliver Native American packaged meals to the Apache elderly.